After what seemed like weeks of rain a sunny morning enthused 124 runners to visit the Moelyci Environmental Centre this year. A keen wind, mud and standing water greeted the 9 juniors and 115 seniors at Tregarth on Saturday. 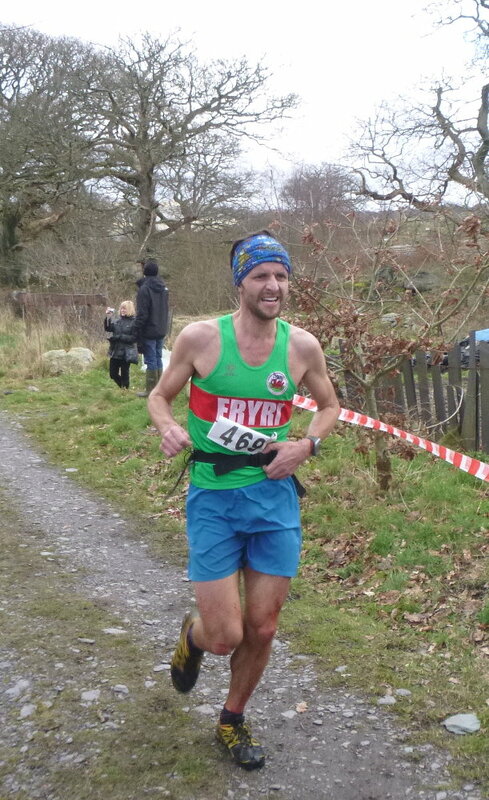 Run in cool but ideal conditions the win went to previous Eryri winner Math Roberts in 37.24 exactly 2½ minutes ahead of last year’s winner Martin Cliffe, 2nd (1st MV40) at 39.54. Cliffetop led a charge of MV40s taking the next 5 places overall: John Parkinson 3rd at 40.02, John Hunt (Dark Peak) 4th at 40.56, Dylan Wynn Jones 5th at 41.02 and Craig Jones 6th at 41.11. The second and third senior men followed with Dyfed Whiteside-Thomas at 42.03 and Ben Lightowler (Abergele) at 42.20. Storming back to form Andrea Rowlands was 1st senior woman in 45.40 at 21st overall. Wendy Trimbel is romping up the leaderboard finishing 2nd at 48.57, closely followed by Helen Teasdale, 3rd woman (1st FV40) at 49.16. Visiting uphill ski champion Gabriel Lees finished next at 50.05. After a good race with Vic Belshaw, Steve P Jones took the MV50 prize at 44.41. Dafydd Whiteside-Thomas was 1st MV60/70 to the summit, but a knee problem allowed three MV70s to pass him on the descent. Dafydd finished 1st MV60 in 57.42. Three remarkable MV70s finished in 65th, 73rd and 77th /115 ! Pete Roberts (Buckley) at 54.21, John Morris (Buckley) at 55.33 and Eryri’s Don Williams at 56.00. 1st FV50 was Juliet Edwards (Meirionydd) at 55.11, with local legend Maggie Oliver taking the FV60 prize at 65.23. Ryan Cain set a new record in the second year on the modified Junior route to win in 9.27, followed by Deian Williams at 10.34 and Connor Roberts at 10.48. Ryan’s sister Jody Cain finished first girl at 5th in 11.41 with brother Jack Cain at 13.42. Tilly Craine, aged 4, won the hearts of spectators finishing in 24.34. Nine juniors ran. Many thanks go to the Centre staff, marshals, ‘Team Dolly’ radio network, the registration and finish team, friends and families. Projects at the Moelyci Environmental Centre focus on sustainability, local produce, local employment and crafts (www.moelyci.org). Yes folks, the race is on this weekend. Due to the huge engineering project going on near Coedty Dam the race was in question up until last weekend, but after some last minute decisions we finally received consent to run the race with a bit of tinkering here and there. There will however be 0.8mile diversion to avoid everyone having to swim. Don’t worry, it’s very interesting and I’m sure you’ll like it. Every cloud has a silver lining! 12noon start, Dolgarrog Community Centre. For those not running the Island Race on Sunday and if your legs are not too sore from Pipe Dream, meet in Capelulo outside the Fairy Glen Hotel at 10:30am SH744766, LL346SP (please don’t park on the Fairy Glen Road itself!). Approx 11Km loop (7 miles in old money) with 550m (1800ft) climb. Gentle run taking in Sychnant Pass via donkey path, Conwy Mountain, Conwy and Altwen – spectacular views of the north wales coast guaranteed! Pint in the pub afterwards! Race 4, hosted by Wallasey AC will be held this year at Birkenhead Park, Wirral. The race will start and finish in the Park opposite Birkenhead 6th form college on Park Road West. The course is 4 laps of the upper park including the path around the lake and will be approx 5.5 miles in distance. Click here for a printable directions map to the college. A limited amount of parking is available in the college car park but it would be better to park on the roads around the Park – there should be plenty of space but it will help if athletes could car share. There will be no vehicles allowed inside the Park. Rhyl 10m Sand Blast 10mile report! There were 6 Eryri Harriers amongst the 515 finishers in the Rhyl 10mile race on Sunday 23rd February. It might have been the usual “Sunny Rhyl” but the very windy conditions made the going very tough for all the competitors with the event run mainly along the seaside especially the last 3 and a half miles as the runners were sand blasted all the way back to the finish! Sale Harrier Steve Boynton won the race, just! in a time of 55:25 ahead of Salford Harrier Matt Shaw 55:28 with Chester Tri’s Chris Prior 3rd in 57:42. The first female finisher was Hannah Holdroyd (Uknetrunner) 67:53. 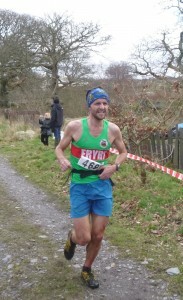 The first Eryri finisher was Ali Chant who has taken a liking to the roads recently and ran very well considering he also ran well to finish 12th overall in the Moel Y Ci Fell race the previous day to place 37th overall in a time of 67:06 with: 39th & 1st MV/55 Arwel Lewis 67:18. 88th Dewi Williams 73:21. 252nd Nic Brook 1:25:33. 350th Ali Thomas 1:33:09 and 459th Iorwerth Roberts 1:46:56. Despite the windy conditions, the inaugural Run Wales organised event was well received and but for the strong winds, the flat course run in calmer conditions is certainly a fast one. All sessions taken by a qualified fell and mountain running coach (certified by UKA) and holding current CRB, first aid certificate and mountain leader award and health and safety qualifications. Joint event between Eryri Orienteers and Clwb Beicio Mynydd Dyffryn Conwy. The iconic Island Race – Anglesey Half Marathon takes place on Sunday 2nd March and is the perfect race to start off your season. It’s a great course with stunning scenery, which is held at the ideal time to get you in shape for either the London or Manchester Marathons! The Island Race starts on Thomas Telford’s historic Menai Bridge and takes runners along the coastline of the Menai Strait all the way to the idyllic town of Beaumaris This half marathon is held on mainly closed roads meaning that it is perfect for runners of all abilities. Please note: you will need to have some fell running experience, a basic understanding as to how to use a compass and, as there will be a series of practical sessions in the hills, suitable kit/ equipment for fell running (including a compass!). It is hoped that a North Wales Course will be arranged in the future.